WILD BLUEBERRIES! 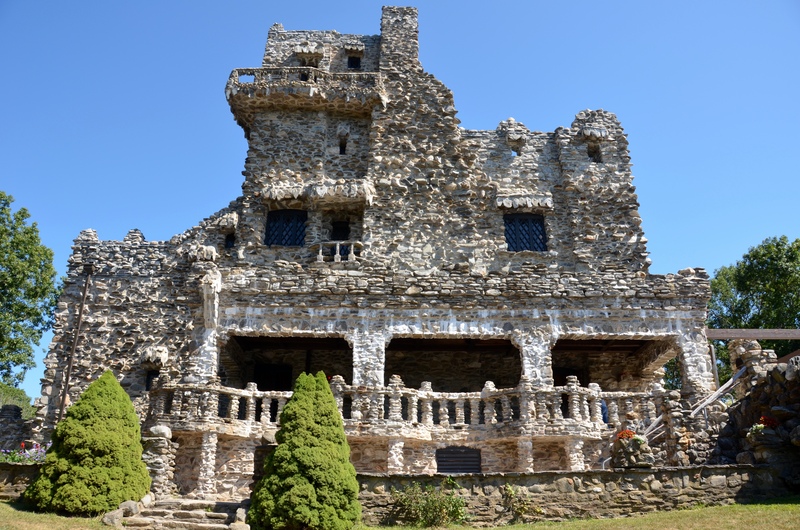 Maine has it all! 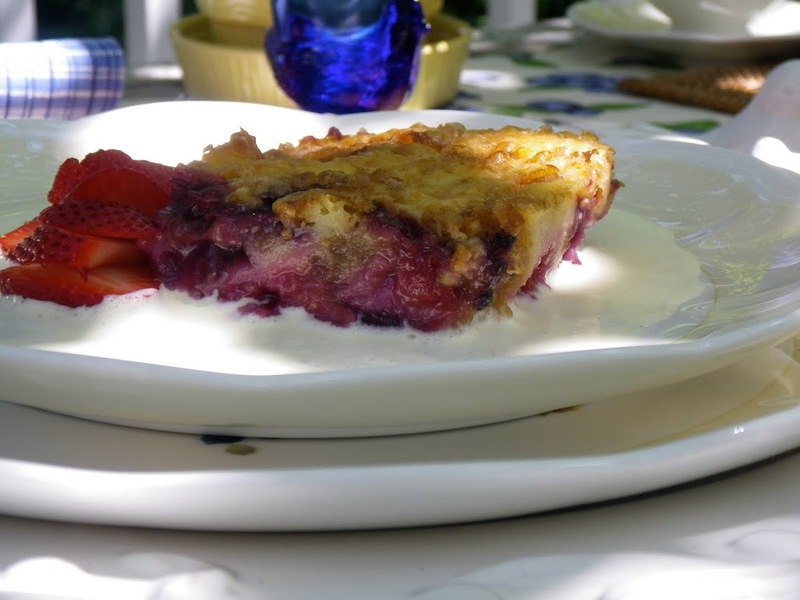 This state berry is so important to Maine that it has its own blog, its own Maine Blueberry Queen, and its own State Wild Blueberry Commission! Just one taste of this delicacy and you will understand. Sweet or tangy? Well, everyone has his or her own description, but “delicious” is always agreed upon. 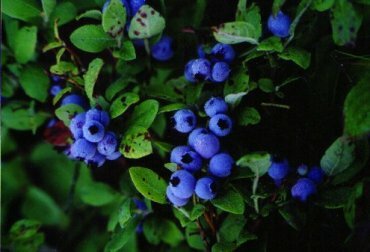 The wild blueberry was first commercially harvested during the Civil War to provide canned nutrition for the Union soldiers, but European settlers had found native people tending the low growing bushes, drying the berries for winter food. 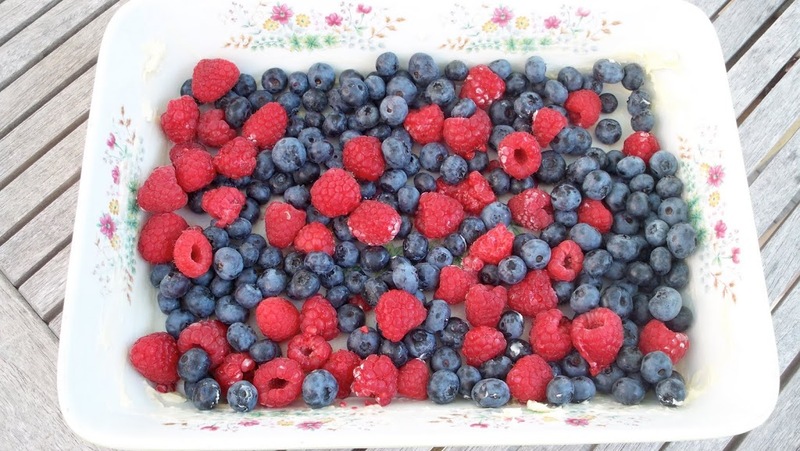 The Passamaquoddy tribe in Maine still harvests the berries. 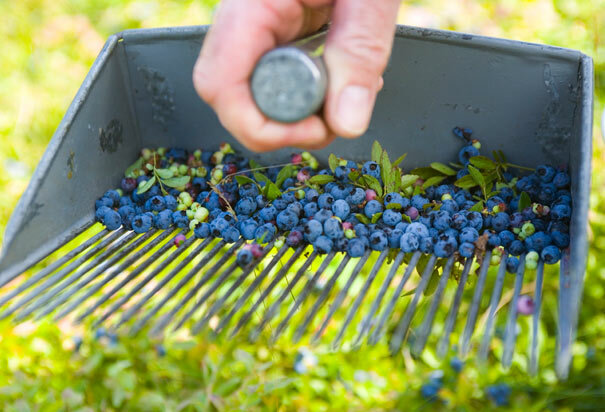 Along with all the other growers in Maine, they use the blueberry rake to scoop berries by the hundreds. My table this week was inspired by a gift basket Mr. Fun received, filled with Maine Wild Blueberry goodies, including jam, syrup, and the dishtowels I used for a table cover. Like a good native New Yorker, he loves New England!! So I’ve set a nice table for him on the deck, under the tree which used to be pink. 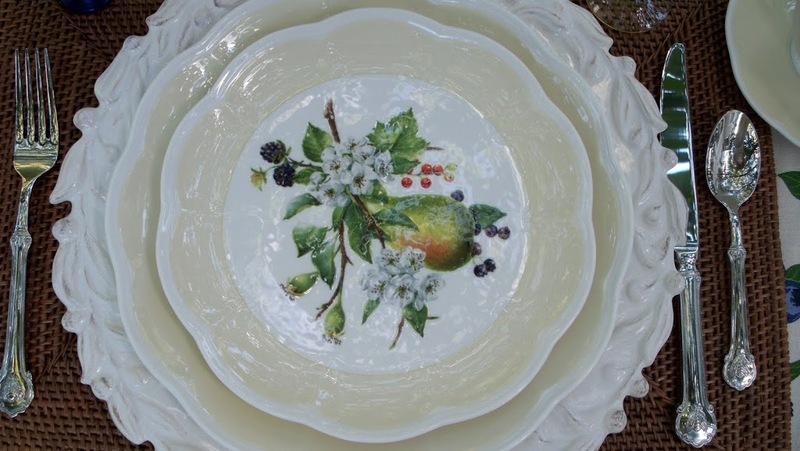 My blue Queen’s dishes rest on beautiful Lenox dishes and my favorite berry chargers. The wicker placemats and napkin rings remind me of berry baskets. Mr. Fun likes to eat healthy, so I’ve provided vanilla yogurt, granola and blueberries (alas, not wild!) for him to mix up in a delicious concoction of his own invention. Looks like we have company. They can eat the granola on the table. After the fruit, grain and dairy, I add some protein. Our little blue egg cups from France in Epcot hold the boiled eggs. We’ve had our dairy, grain, fruit and protein. Now for the fun stuff. 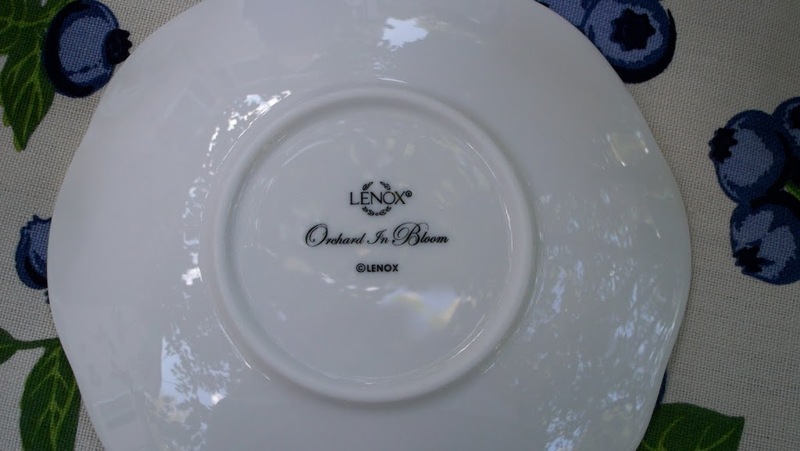 But we’ll need to use the Lenox dishes. 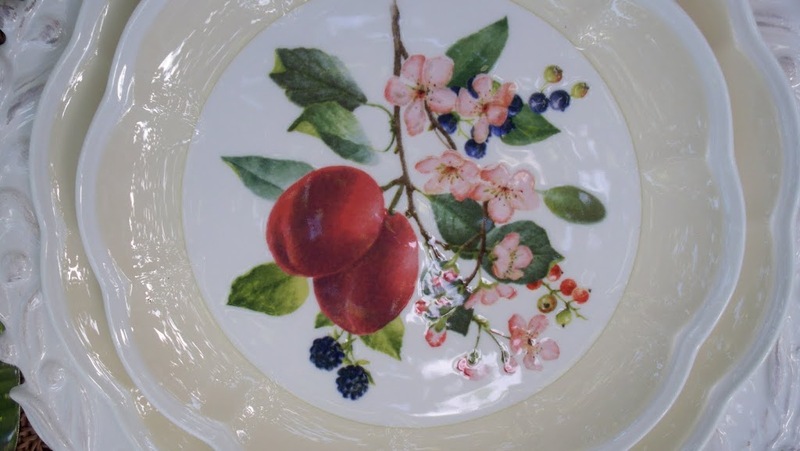 This set includes dishes in Plum Blossom, Pear Blossom, and Peach Blossom, each with a sprig of blueberries! Even the teacups have a pretty little berry. Don’t you love it? 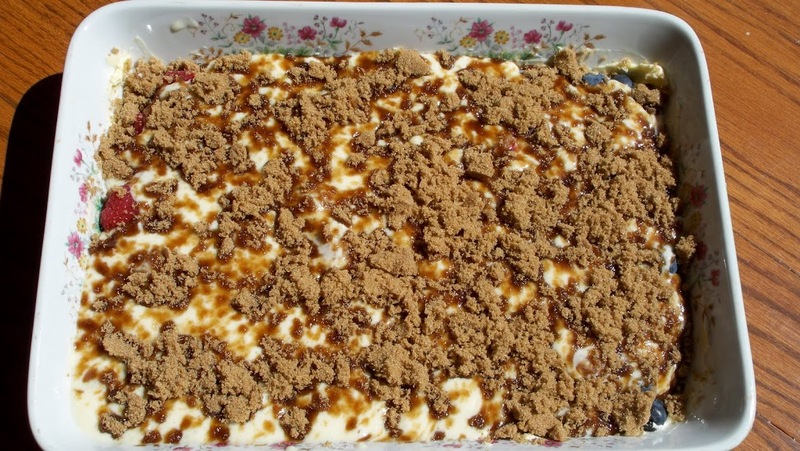 Puzzle pie with cream and strawberries! and cut some blue hydrangea from the yard to put in my yellow McCoy planter. I hope you enjoyed our blueberry breakfast! Linda, I’ll be right over, and I’ll even bring my own fork! YUM! What a super treat you fixed there, and I love your table. 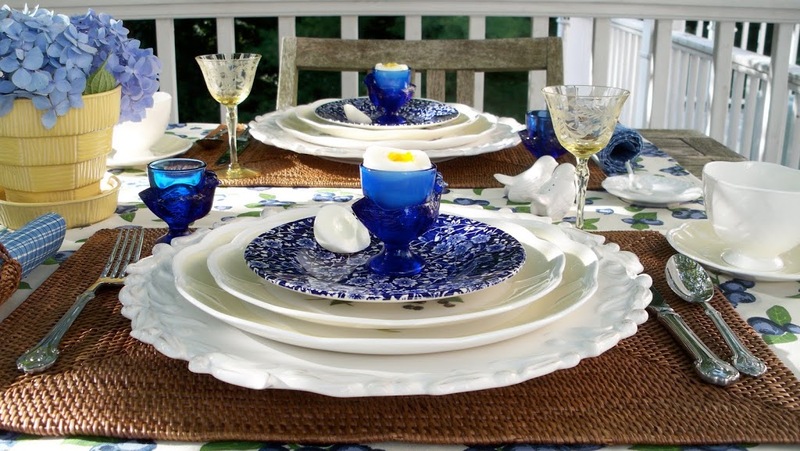 Cute dishes, napkins, napkin rings, glasses, and other accoutrements, but girl, I am in love with those egg cups! Oh, cuteness! Oh Linda, this is so beautiful. You have captured the blueberry theme phantastic. This tablerunner is adorable and the chintz pattern just looks like a blueberry pattern. And those Lennox plates – I would really love to have them. They are gorgeous. 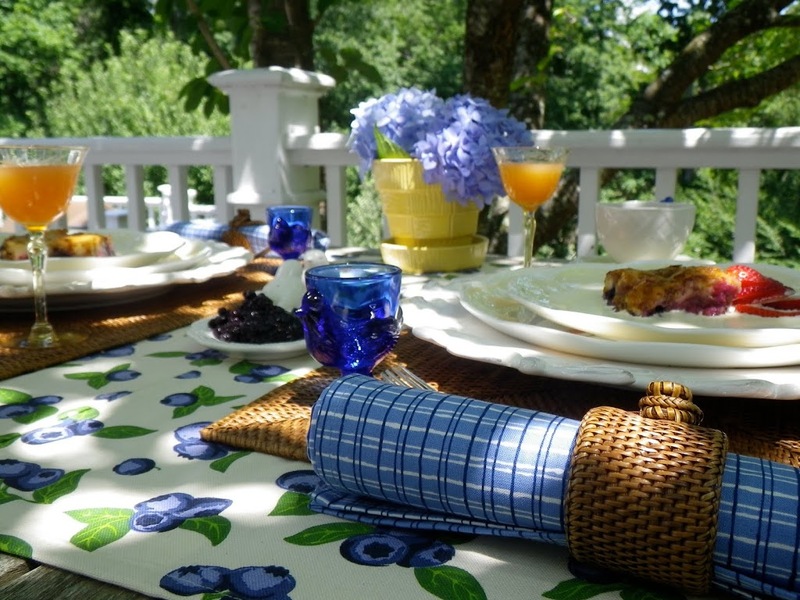 Yes, the wicker placemats and napkin rings remind to blueberry baskets, is true and looks so great at the table. All is so nicely done. Great tablescape. And thank you so much for the interesting informations behind the Maine Blueberries. Linda, what a nice setting for breakfast, or any other meal. 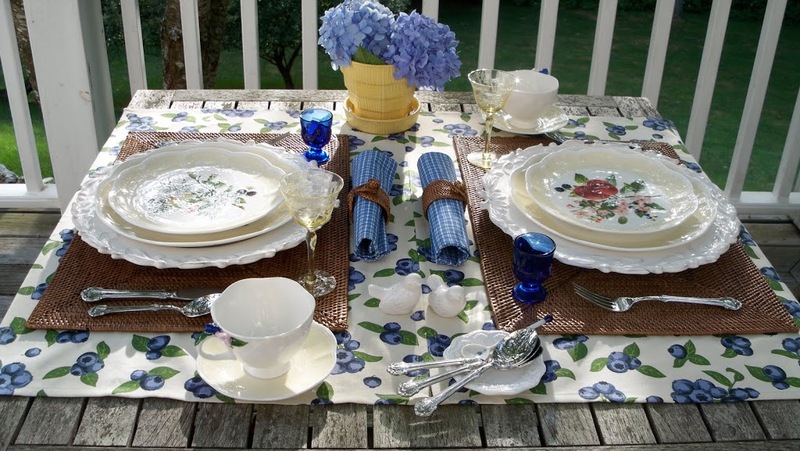 I love blue and white, so clean and crisp…that tablecloth is the cutest. 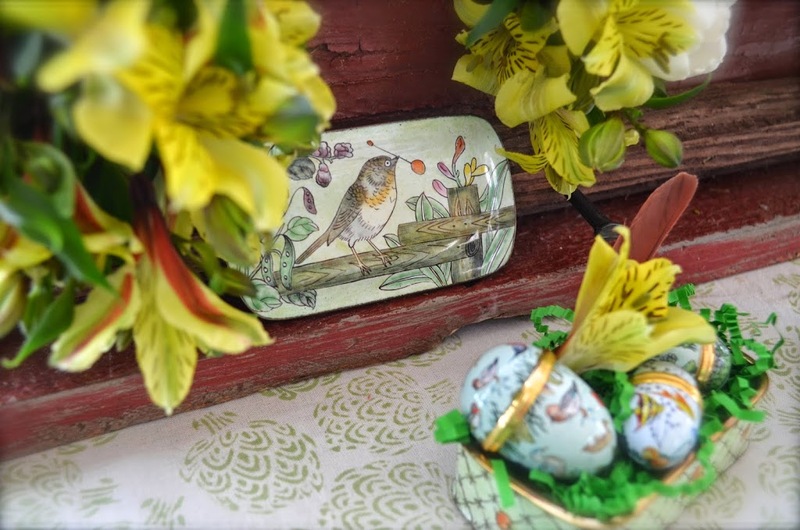 I like the way you have layered all the dishes, ending with the chintz and…♥ those little chicken egg cups, they are darling. The puzzle pie looks delicious. What a wonderful post! Your table is lovely and oh my oh my…..the food looks so yummy!! Absolutely delicious and delightful and so much fun. I loved your narration and the lenox china too. It all came together so well! Soooo lovin’ your overhead shot, and those egg cups are just beautiful-enjoy! So bright and cheery! 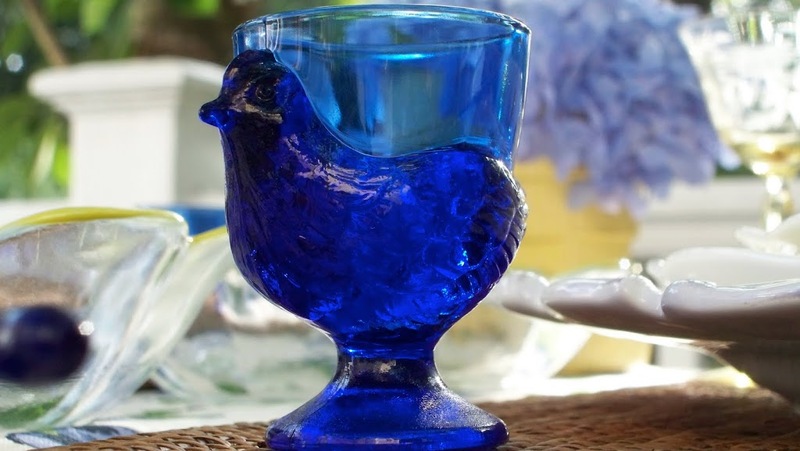 Love the blue egg cups! Those chargers are wonderful! Wonderful! Love all the textures and gorgeous color you’ve brought together. Everything looks so yummy too! What a fresh, summery table! Those chargers are beautiful, and the blueberry tablecloth is so sweet! So pretty — love your beautiful blues and all your wonderful food. This looks like a delightful spot for breakfast. This is just a gorgeous table and setting. I don’t even know where to begin. Of course the food makes me hungry, especially the non healthy dessert! I love your table runner. 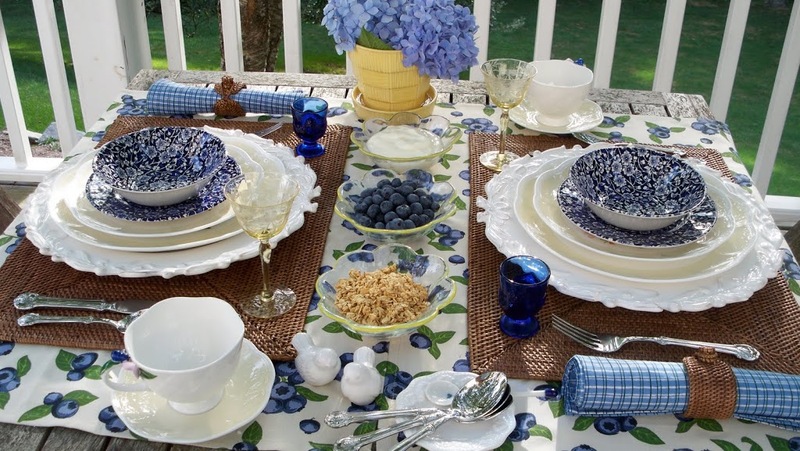 That added so much to your table and those blueberries on the cups are just enchanting. I love your egg cups in the dark blue. Everything is just fab. oh i love blueberries, so of course i love every bit of your fab fresh table, DARLING! Right down the last detail, I really love it. 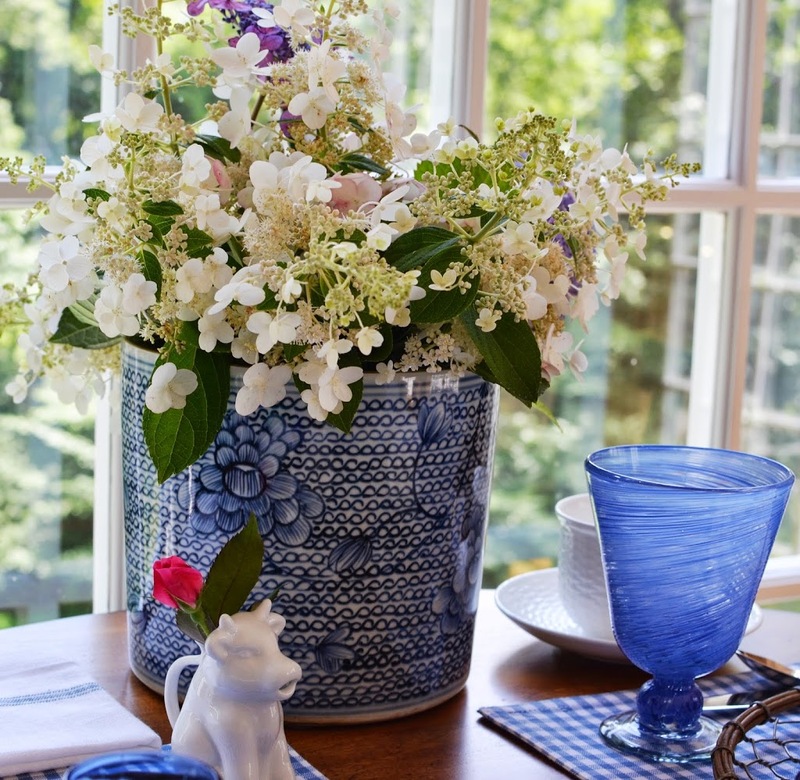 My favorite thing on the table is that tea cup, but I really love all the pops of blue everywhere. 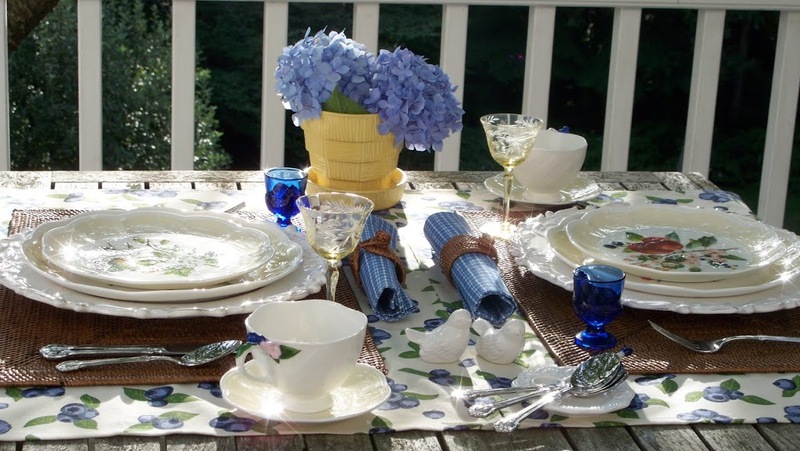 “Blueberry blue” makes a beautiful tablescape! What a wonderful breakfast!!!! 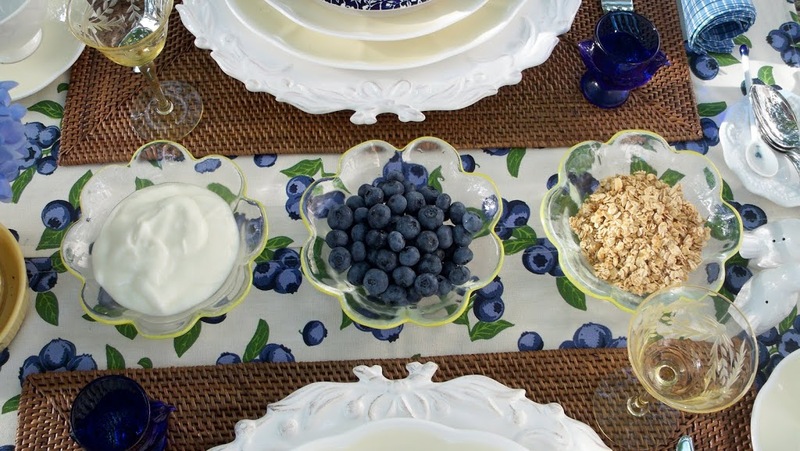 Love the blueberries and granola – just delish. 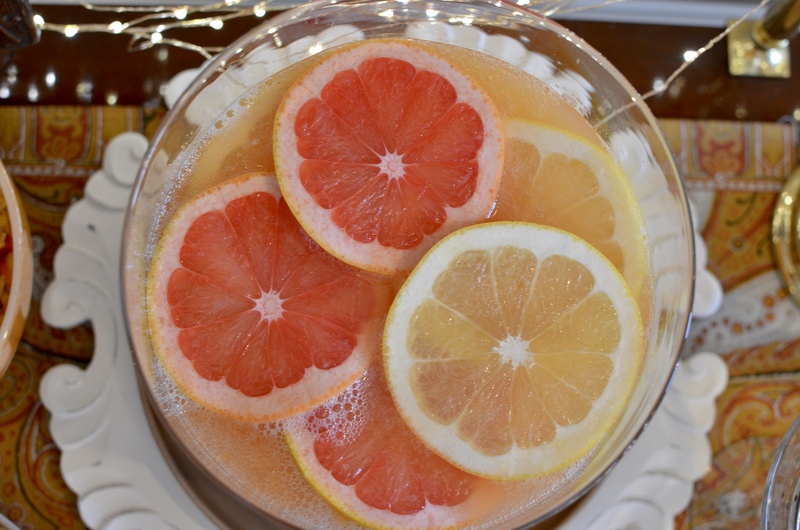 Your table is so refreshing. That is so pretty! I love it all, place mats, dishes, and of course the food! 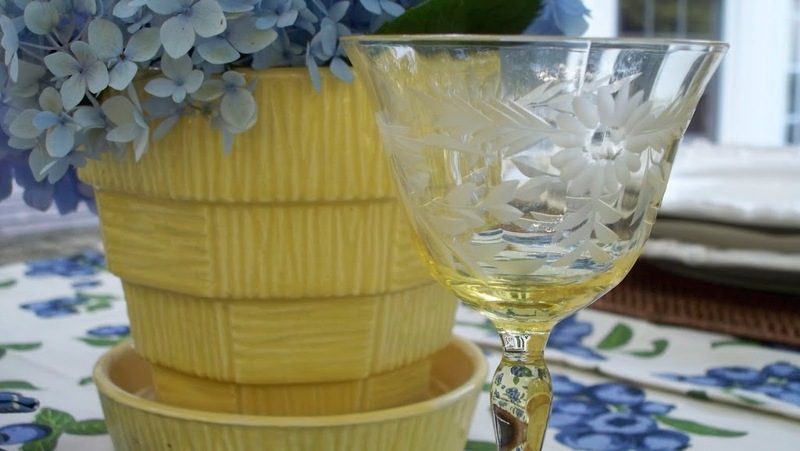 I am drueling over your china…thanks so much for sharing! I really like how you “narrated” your post and took us through the pics with just the right amount of detail to make it interesting. 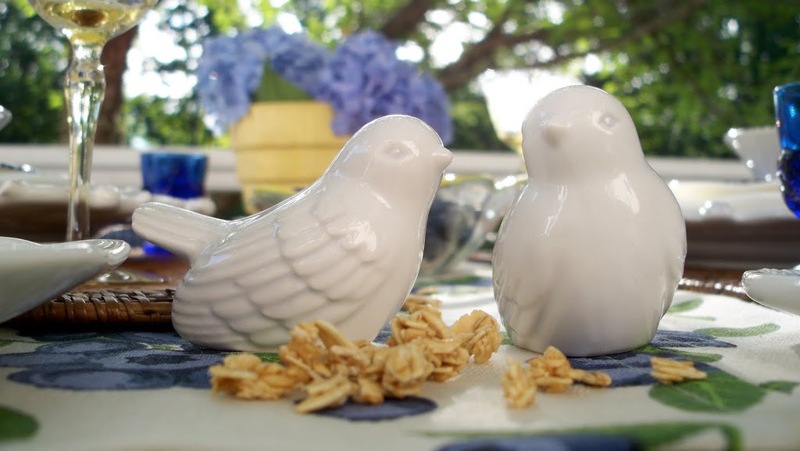 Your words and pics made me want to sit right down and enjoy that yummy breakie at that gorgeous tablescape in the lush surroundings! I thoroughly enjoyed your tablescape. I love the colors and everything you used. I’m in love with those tea cups with the berries! And lovely setting for the table, too. What a lovely, cheery setting. Just what anyone needs first thing in the morning! It would start MY day off right! Very inspiring. What a pretty table! It is so fresh and cool feeling – just perfect for mid-summer. Your dises are so pretty – such gorgeous details. Breakfast looks yummy! So pretty! I love the hydrangeas in the yellow pot. And I love blueberries. 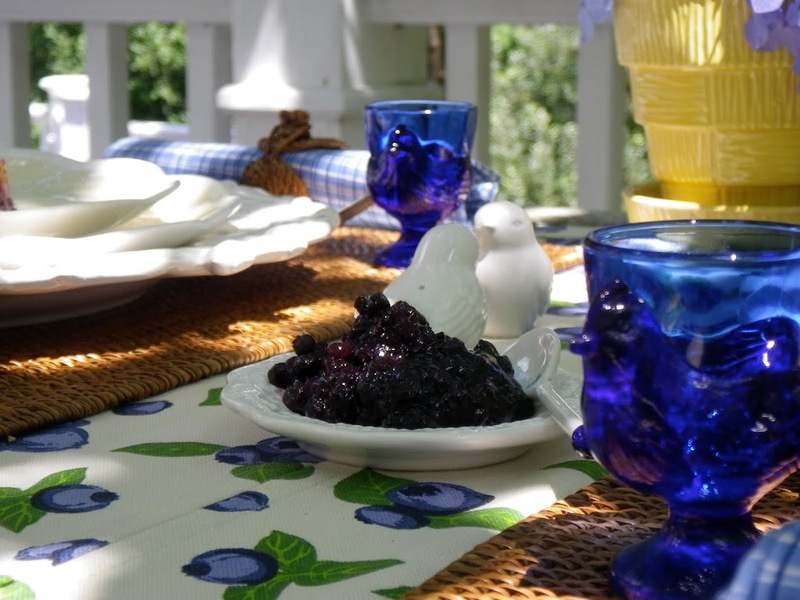 What a perfect blueberry table and how lucky you are to have a friend to send you the wild Maine blueberries. 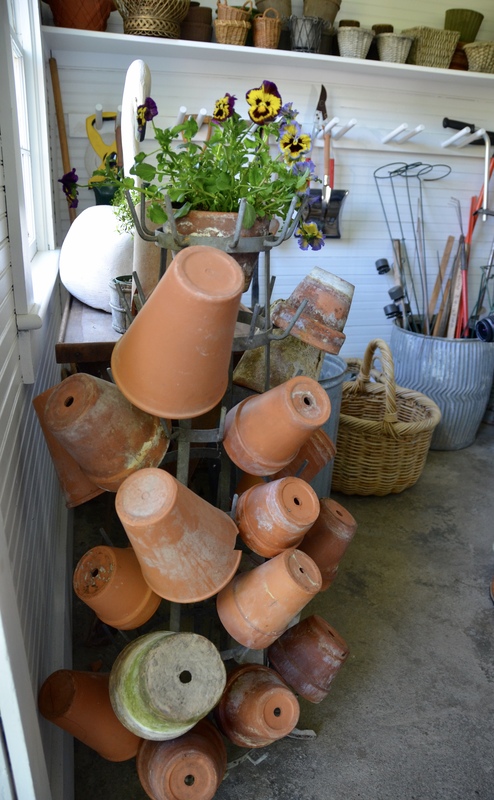 We keep as many as possible right here! A darling table! The little rooster egg cups are so cute! Oh, what a pretty and cheery table! I love it! the colors are fantastic. those egg cups are wonderful and the teacups are so pretty! Beautiful tablescape! It was in Maine that I discovered my true love of blueberries! Your tablescape is so darling. I love all the little blueberry touches and those egg cups are darling. Where did you find those cute napkin ring holders? So lovely! Linda this is cheerful and lovely! I’m not sure what I liked best! It is all soooo pretty! Thank you for sharing. 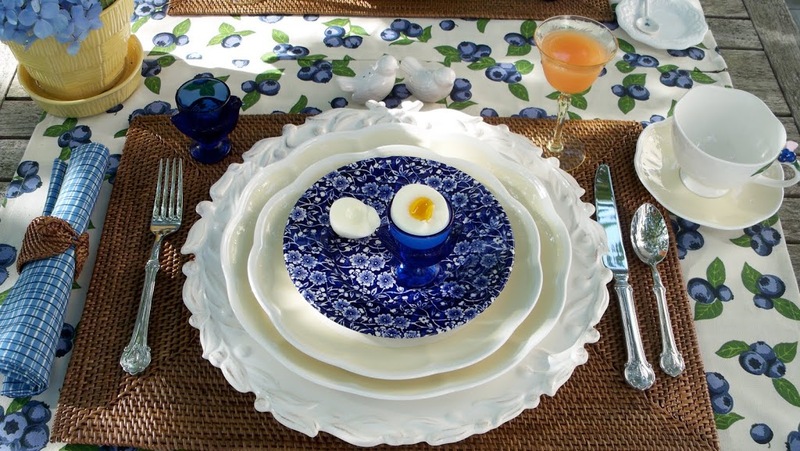 I loved this post and the blueberry themed dishes… You have the good touch for layering and making it all look spectacular and delicious… I am in love with the blue! Lovely blue. 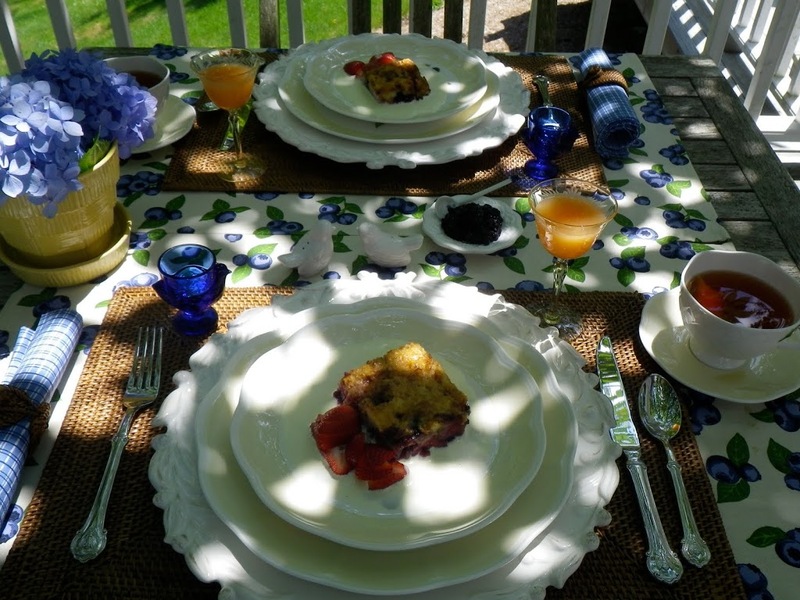 I would love to sit outdoors, enjoy the cool breeze and gaze at your lovely table….to have breakfast, too, delightful. I am following you back. This table took my breath away the 2nd time around! So beautiful table, everything looks so inviting! Beautiful dishes! Linda, I love everything about your table! Your Queen’s dishes are fabulous, I adore the tablecloth and I’ve had my eye on your flatware for a while now . . . and, I have the same napkin rings! I love the title of your blog and I’ve now become your follower as well. Thanks for stopping at my blog and leaving a comment, along with your tip for freezing lime juice. I’m going to give it a try! 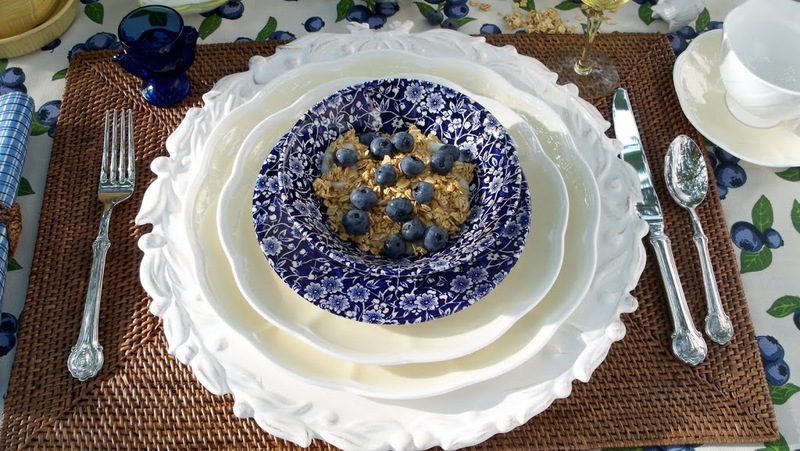 I love your gorgeous blueberry inspired table…as well as that gorgeous table itself. So rustic and cute. Blues are always a fav of mine. Your blog title has me lol over here and I have enjoyed my visit thouroughly. Thanks for the smiles. This is so pretty! 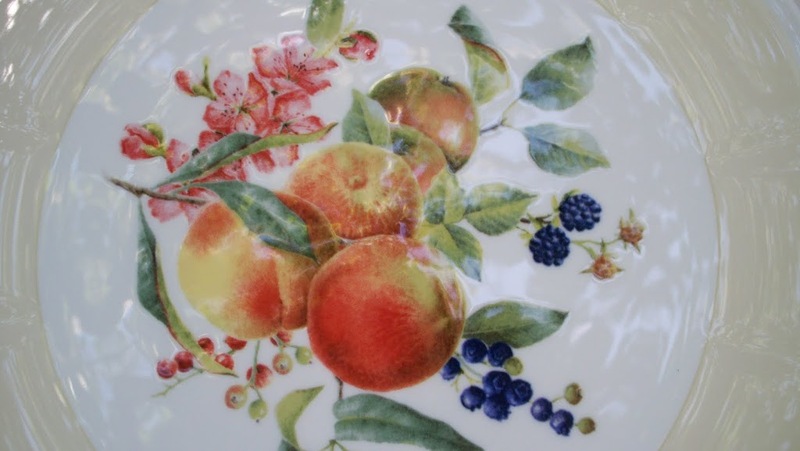 I love, love, love all your dishes, they are gorgeous! Your blueberries look de~licious! What a wonderful breakfast! Thanks for sharing and for stopping by to visit. What a lovely table in such a relaxing setting! I love your blueberry dishes. Beautiful table!! 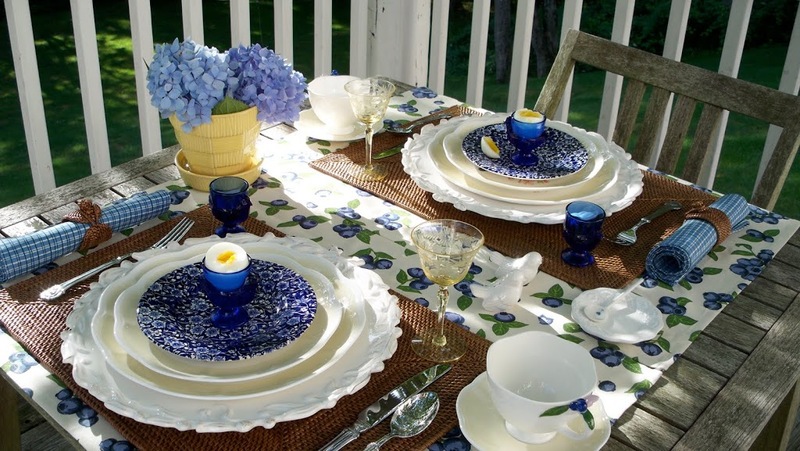 Love the blue and white, and the placemats really set off the blue and white. It is all beautiful and the food looks too good for my diet! I love what you did with this table. I really like the rustic place mat and napkin ring layered with the blue plaid napkin and the blueberry place mat. It is very pretty and such a wonderful spot for breakfast! The berry dish looks delicious too! Thanks for stopping by. Hi Linda, such a lovely table….truly inspiring! Thank you for joining the Rooster Party and displaying the Button. I appreciate it! So glad you are joining us and I will see you on August 6th. Have loads of fun. Linda, I’m crawling through the screen and into your tablescape. Seriously. On 4 out of 7 mornings a week, blueberries and vanilla yogurt is my breakfast of choice. I’ll have to check out your Puzzle Pie recipe! 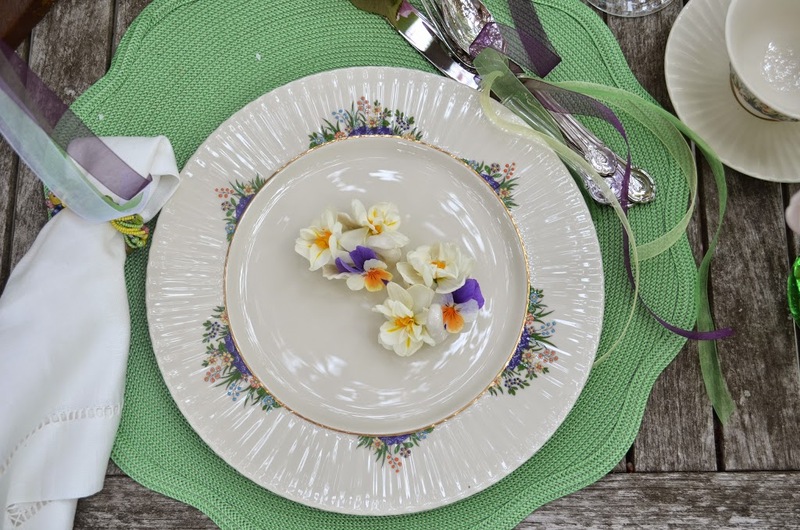 Your table is so inviting-from the darling “runners” to the woven placemats and napkin rings to the egg cups and last but not least the wonderful china! Ahhhh. Perfection. Thanks!!! Thank you so much for popping in to see me. To answer your question – the ice that fell off the glacier sounded like a bomb almost. When the smaller ice particles fell – they sounded like gun fire! The reason we’re wearing those silly white hats – they’re supposed to be chef hats. That night at dinner was called “Chef Night” and they had put the hats on the table for us to wear. We looked silly, but we didn’t care! I always appreciate you popping in. What??? I’m too late??? It’s PASSED? Well, OK then – – – it’s still a GREAT blog title anyway! You had me at the first blueberry!! LOL! Wow! What a gorgeous tablescape. Love the vibrant pictures and your dishes make my heart skip a beat. Thanks so much for sharing this with us. Welcome to blogging and please stop by and see me too. By the way, I just ate some blueberries with my lunch! OMGosh, woman…..this is all just STUNNING. I love your beautiful table…your dishes…your blueberries..everything is just wonderful. Thanks so much for inviting me over…I surely wouldn’t have wanted to miss this adorable setting. Your table looks so cheery! I love all the blueberries. The little blue egg cups are precious. Your table makes me feel so happy. I see you are from my neck of the woods. I live in California but once lived in Sharon, CT. I am becoming a “follower” on your blog. I recently started blogging too. I’d love you to stop over and say hello. I’ve had camera problems lately so the last few posts have been difficult but that is being corrected. I became a follower but my little rosebud icon has disappeared so you will only see my “following” in generic silhouette at the end of your followers list. Thanks so much. My friend, I am just now getting around to my blog correspondence. Thank you so much for coming by and taking a peek at my little blue cottage veranda! I sooo enjoyed your visit and sweet note…thank you!!! I also wanted to thank you for adding Happy To Design to your list of blog follows…I am just elated! I have also added your delightful blog to my list. I really look forward to your upcoming posts and going back through your past posts! It’s so very nice to meet you, Linda! 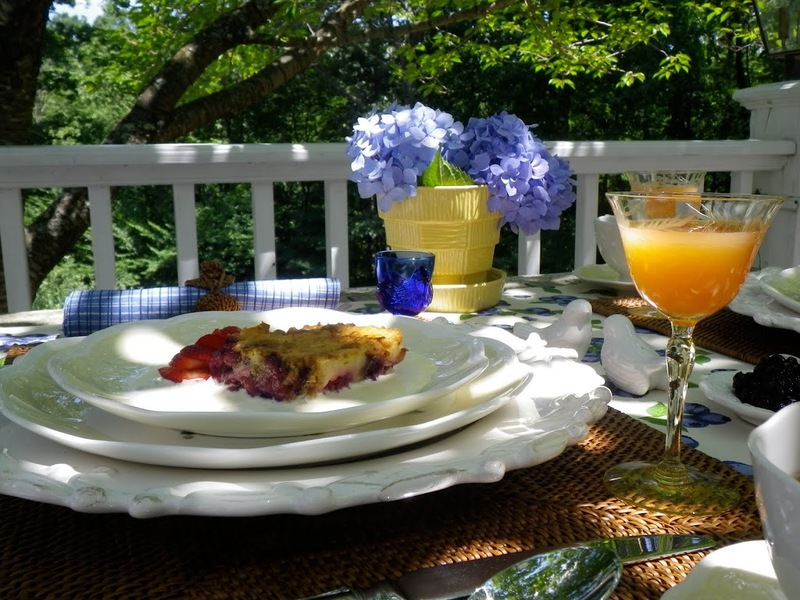 Well my friend, I must tell you that I just “swooned” over your beautiful blueberry table! 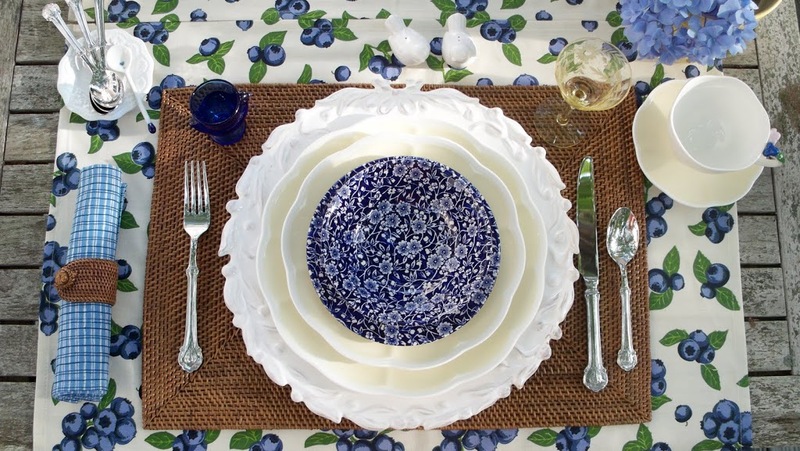 It’s absolutely perfect…from those gorgeous blueberry table linens…right down to all those lovely dishes! Ohhh…this was such a treat for me! I love, love, LOVE your berry chargers…gorgeous! And…the Lenox Orchard Blossoms is one of my favorite patterns! 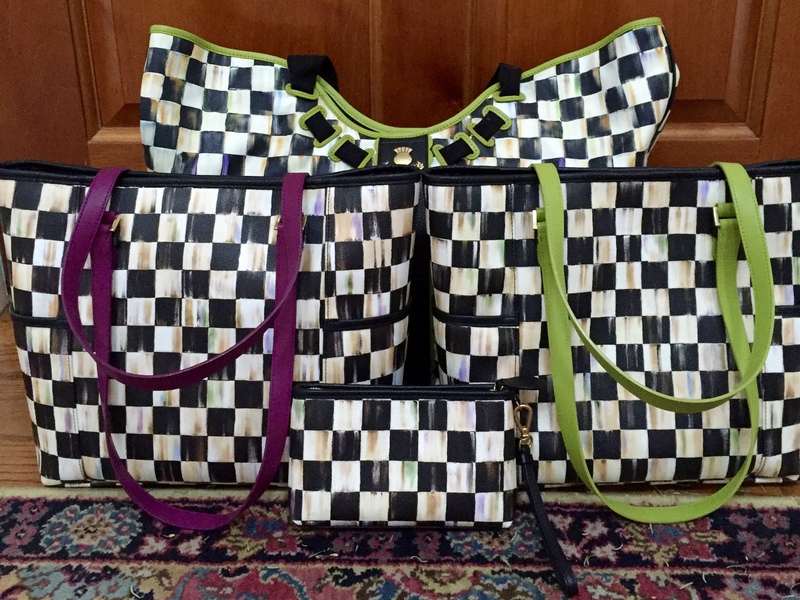 I have to tell you, I have been “eyeing” that pretty pattern for sometime now…I would love to have that set! 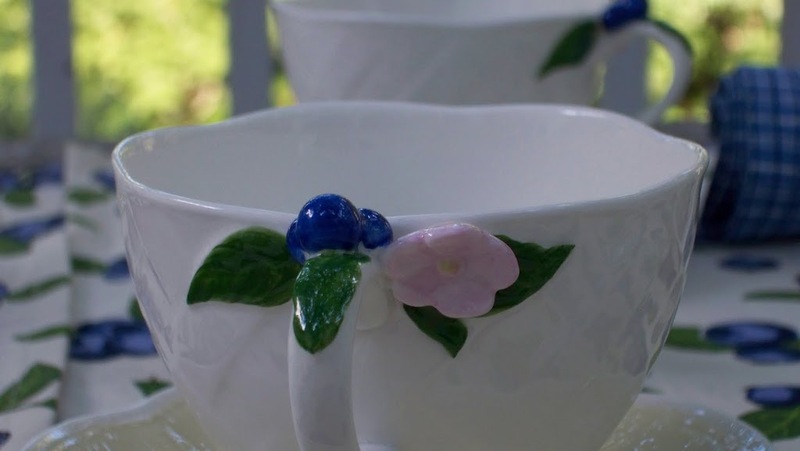 I also just adore your pretty teacups with the blueberries on the handles…ohhh, sooo pretty! Well my friend, you certainly know how to set a stunning table! I would have loved to been your guest! Hehe! I have never heard of a puzzle cake before but it looks scrumptious! Blueberries are one of my most favorite fruits!!! Thank you so much for sharing this fabulous table with us…it was truly a treat!! !